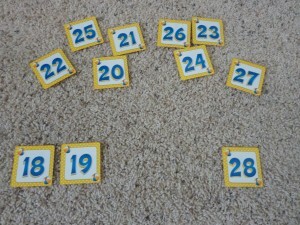 I love to use calendar numbers in My Obstacle Course stations. They add instant theme and require no preparation to make (although you could make your own if you are so inclined :).). I just like to get things that I can put into a My Obstacle Course kit (see below) so I can set it up quickly while still having it be fun, child-friendly and building skills he is ready for. 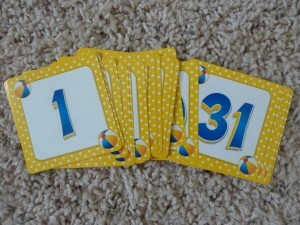 These particular calendar numbers are summer themed and are the same numbers shown in my Story Starters post. I love when I find materials that can be used over and over again in different ways! Keeps things interesting for him and is easy on my wallet! 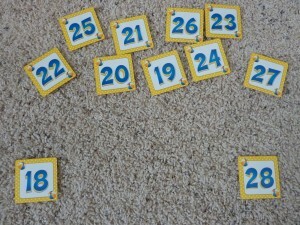 I was recently asked about ways to work on number sequencing and my mind immediately went to doing this using calendar numbers. My Obstacle Course station activity set up and ready to go. When setting up this station, I put out the first and last number of the group I want him to sequence and place the numbers needed to fill in the spaces above. Do they have number recognition? 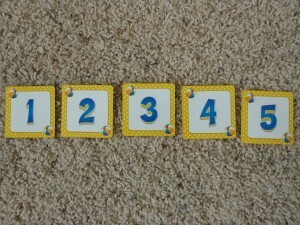 Can they place the numbers in the correct sequence? 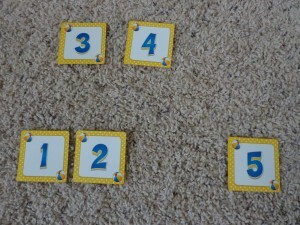 If they can count to five, can they match their counting with the number? I know that for a while, Andrew would count out loud but the numbers he was pointing to didn’t always match up. I would have him slow down but also ask him to point to certain numbers so I could tell if he really knew what they were. 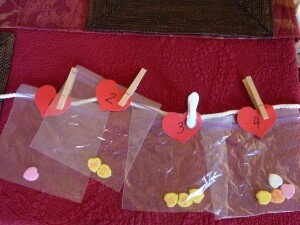 One to one correspondence using candy hearts. 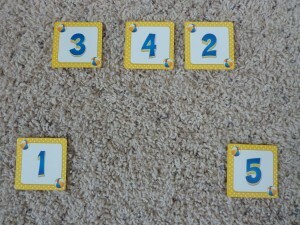 My Obstacle Course Station Activity: Put the numbers in order from 18-28. 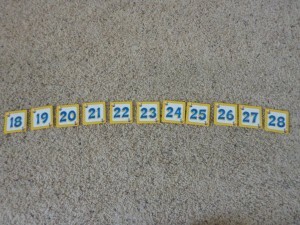 Numbers in order from 18-28. This is a skill that shows up in math curriculums and is part of recognizing patterns in math. I will do a post soon about other ways to use these numbers to work on more complicated math skills knowing that all children are different and while they may struggle in one area, another area may be a strength, needing to be challenged a bit more. My Obstacle Course kit – I’ll be posting next week on how I put together a super easy My Obstacle Course kit in order to build developmental and academic skills. As always, please email me at obstaclecoursemom@yahoo.com with any questions or skills that you’d like me to post on. Thank you for allowing me to share!